Wondering what to o with those banana split dishes? Make a taco sundae! This recipe is from Wholly Guacamole, which uses its Wholly Guacamole Classic Dip and Wholly Salsa. It takes just 20 minutes to prepare. There’s no ice cream in this sundae! Photo courtesy Wholly Guacamole. 1. BROWN the ground meat; then add the taco seasoning, adding a little water as needed to distribute the seasoning evenly. Stir to mix well. Continue cooking another 5 minutes. Remove from heat and stir in 3/4 cup of the shredded cheese. 2. HEAT the refried beans. 3. COMBINE combine the sour cream with the Wholly Salsa dip in a small bowl. 4. COVER the bottom of the dish with the shredded lettuce. 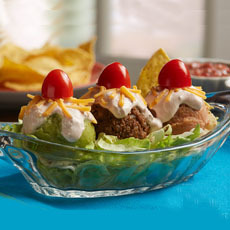 Scoop the meat with the ice cream scoop, pack it with a spoon and place in the middle of the bed of lettuce. 5. SQUEEZE the guacamole into the [cleaned] scoop, smooth with the back of a spoon or knife and place on one side of the meat. Place a scoop of beans on the other side of the meat. 6. POUR a tablespoon of the salsa mixture over each scoop. Sprinkle with shredded cheese and place a cherry tomato on top. Serve with corn tortilla chips.